Stranded in a lonely Cornish railway station late at night an ill-assorted group of characters find themselves caught up in the eerie tale of a spectral train and the series of startling events that its imminent appearance sets in motion. The Ghost Train is a thrilling and chilling suspense drama with plenty of twists and turns and it certainly kept everyone guessing to the very end. Its special effects were unrivalled in its day and the dramatic appearance of the Ghost Train itself is a spectacular piece of theatre; a spooky evening out that had audiences on the edge of their seats. In the run-up to Christmas, Guildburys were delighted to join forces with the Rotary Club of Guildford district to raise funds for Disability challengers and an evening performance was dedicated to doing just that, raising £1675. Might I say that I really enjoyed “The Ghost Train.” My companions and I had a lovely evening at the Electric Theatre watching this. 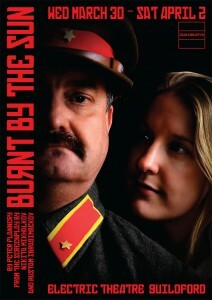 It was a really entertaining and suspenseful production! We all had a great time. ‘In the words of the director, Rob Sheppard, ‘The Ghost Train is a good old fashioned yarn of the kind that used to be found in boys’ comics, magazines and annuals’. 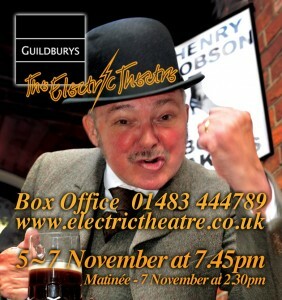 Written by Arnold Ridley and was first performed at Brighton’s Theatre Royal in 1925. The play is set in a Cornish railway station which in this production was beautifully designed by Ian Nichols and evoked an air of old-fashioned charm. Into this rather stark room of muted creams and browns tumble a nervous band of travellers who have been marooned in the late evening with so sign of a train until the early hours. We learn that the nearest house is 5 miles away and that it is inconceivable that the ladies in their finest clothes could walk that far. The play took a little while to warm up on the night I went, a bit like the chilly railway station, but once the cast got their confidence the action rolled along at a hearty pace. 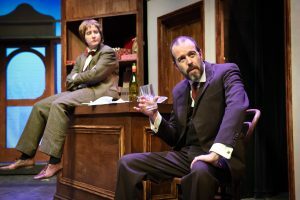 It is hard to pick out a particular star amongst this very able cast, but Pam Hemelryk, as the prudish Miss Bourne who gets tipsy after a hearty sip from a hip flask, had the audience in stitches and seemed completely at ease on stage. 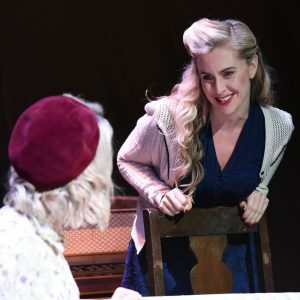 She has the knack of cutting across a conversation making it all the more convincing, and she managed to lie still on a table for nearly a whole act – possibly a dream role for some! The set, a simple effective 1920’s railway waiting room was designed by Ian Nichols and constructed by Stage Manager Michael Burne assisted by Mike Dean and Brian Meldrum. 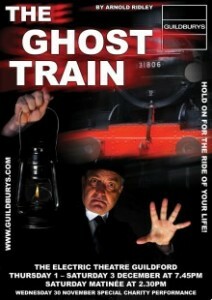 Robert Sheppard directed this fast moving production of The Ghost Train, about a spooky train crash which happened many years ago and is re-enacted every year at the same hour, well assisted by the cast who kept up the pace of the play in a very professional manner. All the actors played their parts in a convincing manner creating the required tension. 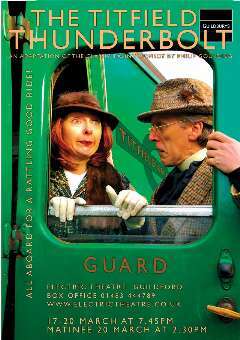 Special mentions of the station master Mark Ashdown (Saul Hodgkin) with his superb Cornish accent, Pam Hemelryk (Miss Bourne) as the tipsy, very hilarious lady with a liking for brandy and Eddie Woolrich (Teddie Deakin) in the comic part. A highlight was the convincing acting of Claire Racklyeft (Julia Price) when the train was about to arrive. Well done to the entire cast. 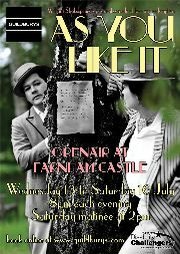 ANOTHER SELL OUT AT FARNHAM CASTLE ! 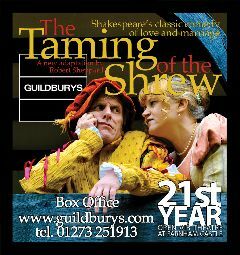 Guildburys celebrated their 21st year at the castle in style with this new adaptation of Shakespeare’s much loved tale of the battle of the sexes. 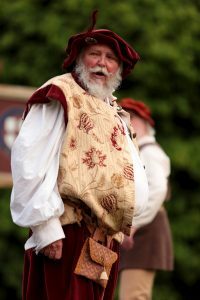 The stormy relationship between the colourfully eccentric Petruchio and his scornful and unwilling bride Katharina was played against the magnificent castle backdrop, transformed into an Elizabethan playhouse – home to The Lord Bishop’s company – whose boisterous actors were to be found carousing in the adjacent Blue Boar Tavern, (complete with comely serving wenches !) as they waited for Master Shakespeare to complete the final scene of his play. The weather may not have been as kind as it could have been, but it did nothing to dampen the enjoyment and loyalty of capacity audiences. A CLASSIC EALING COMEDY – FEATURING 2 TRAINS, A BUS AND A STEAMROLLER! This Guildburys production didn’t disappoint and we knew that we were in for an entertaining couple of hours.I had been looking forward to this production & I wondered how they could stage a version of this 1950’s Ealing comedy. The setting was simple and Ian Nichols’ set props and Simon Price’s lighting and sound design were undoubted stars of this production. Period was also perfectly created by Diane Nichols’ costumes which accurately captured the austerity of the early fifties but still with the obligatory matching shoes and bag and doubtless a net petticoat to puff out the full skirted dress.The cast worked well as an ensemble, all striving to be true to the Ealing comedy genre, keeping tongues firmly in cheeks. A rattling pace was sustained throughout and culminated in the cast singing their curtain-call with gusto. 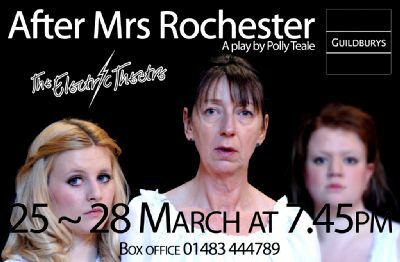 This was Director Gilly Fick’s first production and, this being so, I certainly look forward to her next one! OPEN-AIR theatre is always special, whatever the weather. As long as you have someone special to cuddle up with and a well-performed piece to keep you warm through the driving showers you are bound to enjoy the show. That was the case on Friday evening when the Guildburys came to the moat at Farnham Castle for their twentieth year. Renowned for their high quality productions this year was no exception with a fabulously staged Shakespeare play, ‘The Comedy of Errors’. 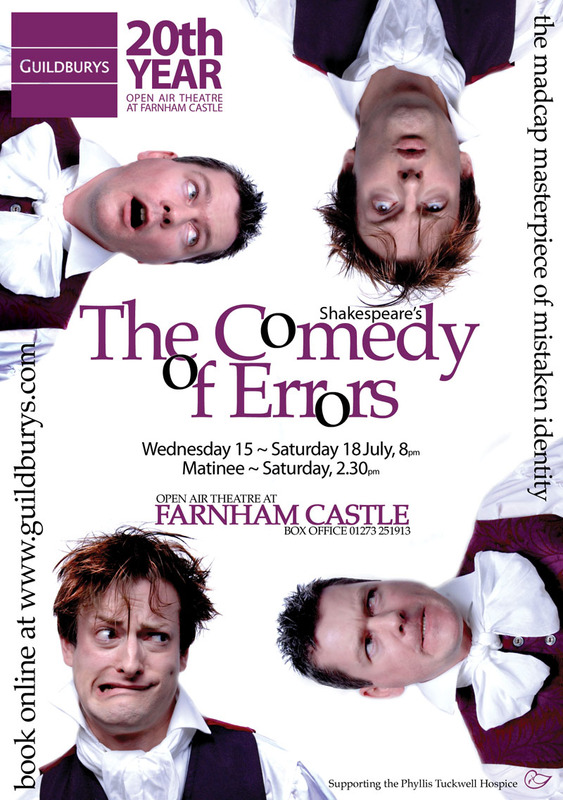 This is not necessarily Shakespeare’s best, but none the less full of poignant comedy, mistaken identity, glorious English style slapstick, farce, puns and elegant wordplay. The performance that most stood out for me was that of Dromio of Ephesus the indigenous servant of Antipholus played by Luke Owen. His comic timing was superb and really brought out the fool in his character. Angelo, the goldsmith played by Michael Lawrence was also another highlight of the show. 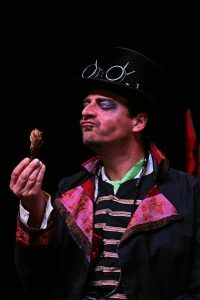 He brought more comedy with his somewhat camp performance of the artisan..
PRIZE DRAW RESULT – MR P. MENDHAM WINS CHAMPAGNE AND TICKETS TO NEXT YEAR’S SUMMER SHOW !